Here is the first part of the patchwork tutorial to make this quilt top. The finished size is approximately 45″ x 59″. 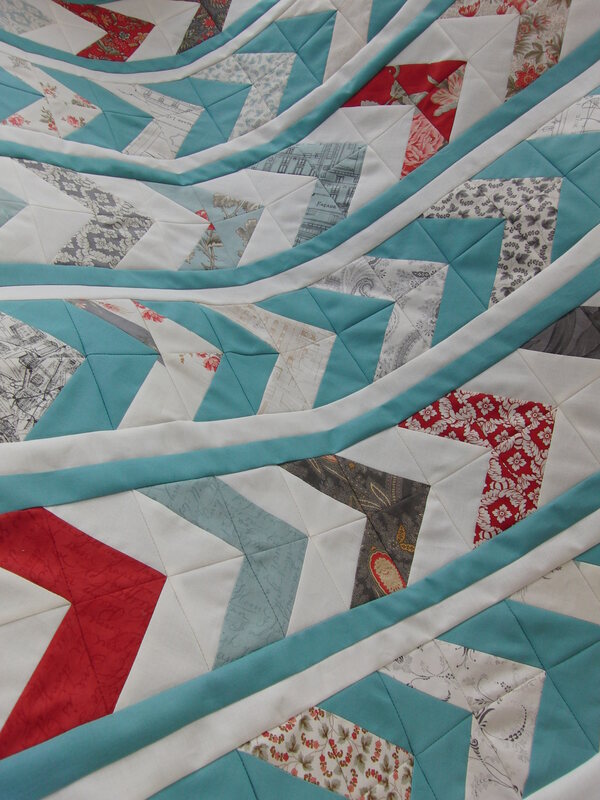 I have chosen four colours to make my quilt but if you want a more scrappy look just raid your stash! PLUS wadding and backing fabric. I will be working with White, Robin’s Egg, Teal and Purple from the Moda Bella Solids range. A “strip” means a strip of the given size cut across the width of fabric. Cut seventeen 2 1/2″ strips. Put six strips to one side for the binding. From another strip cut one rectangle 12 1/2″ x 2 1/2″ and four squares 2 1/2″ x 2 1/2″. From each of the remaining ten strips cut three rectangles 12 1/2″ x 2 1/2″ and two squares 2 1/2″ x 2 1/2″. Cut one 4 1/2″ strip. From this cut nine 4 1/2″ x 4 1/2″ squares. Cut one 4 7/8″ strip. From this cut eight 4 7/8″ x 4 7/8″ squares. Cut one 5 1/4″ strip. From this cut four 5 1/4″ x 5 1/4″ squares. Cut two 2 1/2″ strips. From one of these cut four rectangles 2 1/2″ x 4 1/2″ and from the rest of these cut eighteen 2 1/2″ x 2 1/2″ squares. Cut one 5 1/4″ strip. From this cut six 5 1/4″ x 5 1/4″ squares. Cut two 4 7/8″ strips. From these cut thirteen 4 7/8″ x 4 7/8″ squares and CAREFUL two 4 1/2″ x 4 1/2″ squares. Cut two 4 7/8″ strips. From these cut fifteen 4 7/8″ x 4 7/8″ squares. Cut one 5 1/4″ strip. From this cut four 5 1/4″ x 5 1/4″ squares and CAREFUL three 4 1/2″ x 4 1/2″ squares. Cut three 2 1/2″ strips. From these cut forty four 2 1/2″ x 2 1/2″ squares. Cut one 5 1/4″ strip. From this cut three 5 1/4″ x 5 1/4″ squares. Cut one 4 7/8″ strip. From this cut six 4 7/8″ x 4 7/8″ squares and CAREFUL one 4 1/2″ x 4 1/2″ square. 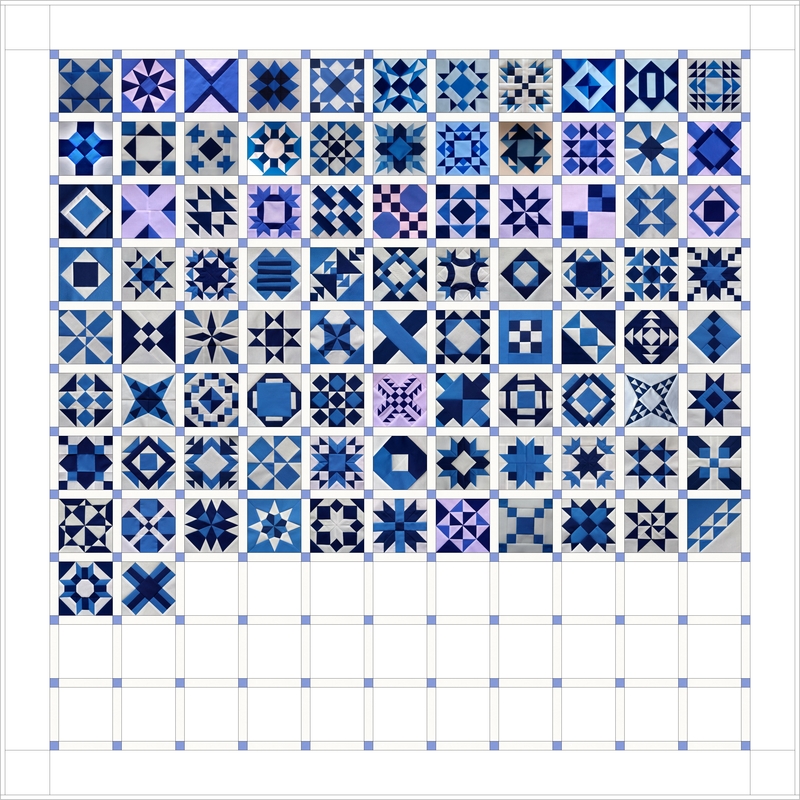 If you prefer to use scraps, here are the number of patches of each size and colour you will need. PLUS 6 binding strips of 2 ½” across the width of fabric. and here they are cut, labelled and ready to sew. Part 2 will be a photo tutorial to make the first block. You can find it here. Bringing up the past and something new…. No time to comment….must start cutting!!!!!! Great tutorial! Love the colours too. Wow! You’ve really set yourself a challenge. Looks like it will be a great set of tutorials though. Thank you! If there is no challenge, there is no point 🙂 I’m doing it to document the process for me really but if anyone else finds it useful in the future then that is a bonus. I’ve made and photographed the first block so Part 2 will be coming soon.